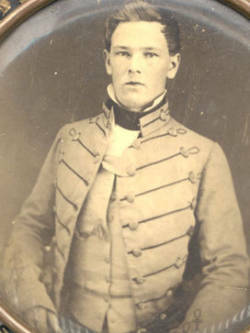 Biography & Genealogy: Jacob Lynn Deitrick, Class of 1857: Genealogy: Born- ca. 1836 at Coal Hill, Henrico Co. Va. Father- Capt. William A. Deitrick of Rockbridge Co. Va.; Mother- Sarah A. Williams of Henrico Co. Va. Pat. Grandfather- Jacob Deitrick; Pat. Grandmother- Elizabeth Van Der Lind. Mat. Grandparents- unknown. Married- Pattie E. Coates. Children- Sons: Dr. J. L. Deitrick; Claude P. Deitrick; V. S. Deitrick; S. C. Deitrick; Daughters: Connie Deitrick, who married O. G. Cross; Mabel Deitrick, who married George Sheppard; Mrs. W. C. Taylor [given name unknown]; Mrs. W. B. Sutton [given name unknown] VMI Record: Entered VMI- Aug. 5, 1854; Dismissed Jan. 31, 1855 for insubordination. Military Record: Enlisted May 9, 1861 at Ashland, Va. as Private in Co. G, 4th Va. Cavalry; His horse, valued at $1400 was killed in action May 9, 1864 at Spotsylvania; Deitrick was paroled at Ashland April 25, 1865. Careers: Farmer. Died- Jan. 30, 1892.